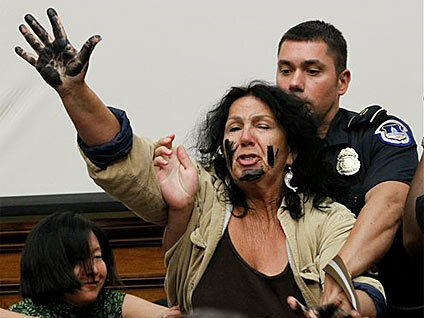 As BP CEO Tony Hayward began his opening statement before the House Committee on Energy and Commerce today, a woman with what appeared to be oil smeared on her hands and face disrupted the hearing, yelling, in part, "you need to be charged with a crime." She was eventually subdued and escorted out by capitol police while continuing to yell that Hayward should be charged with a crime and go to jail. The protester was the same woman arrested at a Senate hearing last week - Diane Wilson, a Texas shrimper and activist and co-founder of Codepink for Peace. At that hearing, Wilson dumped what appeared to be oil on herself to protest Alaska Sen. Lisa Murkowski's blocking of a bill that would have lifted BP's liability cap.